Situated half a mile from the Bodiam village itself and its fourteenth century castle the station opened in 1900 in a rather remote and rural location. Although not an English Tea Room in the traditional sense, I could not help but to include the Tea Room at Bodiam Railway Station; it is rather small with a couple of tables, offers tea and a small selection of cakes, chocolate and sweets and is so quiet, you could sit there and drink tea for hours, like I do sometimes! 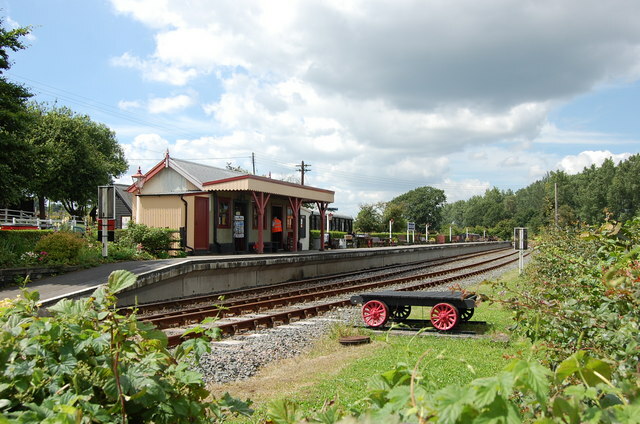 It is within walking distance of Bodiam Castle which does have a self service tea room - Bodiam Castle Tea Room but the tea room at Bodiam Station, although smaller than most kitchens, is great to visit and on a lovely day, drink your tea on the station platform. Actually, sitting in the platform actually reminds me of the NAKMAS head office of which design and build was based on Bodiam Railway Station, has a similar platform and structure as Bodiam Railway Station. If you really enjoy traditional English surroundings and a beautiful countryside, then Bodiam Railway Station is a must. Best visited on a summer's day. I would have to provide a personal recommendation to the Tea Room at Bodiam Railway Station and I suggest you visit there, get yourself a cuppa, take a pleasant train ride and enjoy yourself.